The first parent of a child in one of our classes who attended the three way interviews held at one of our schools recently was almost tearful when she asked, “Is my child special needs, because nothing that I know about him suggests that he is?” I then explained to her that the top part of our school report is the part that the government wants us to use to tell you about your child’s learning. I told her it’s about national standards and three words that are meant to tell you how your child getting on at school: “At the standard”, “below the standard” or “above the standard”. This continued, as I had to explain to the parents of kind, thoughtful, creative risk taking students that their child was below the expected level for their age according to the National Standards. I had to say to the parents of children who share their learning with others, challenge each other and themselves, set their own goals and work hard to achieve them, that their child was below the standard, but that was what the government wanted me to tell them. For all of the children we have taught over the twenty five years who have left secondary school and gone on to be successful employers and employees, the way they experienced their schooling did not include anything remotely like national standards. The experience for them was a combination of seeing the relevance of their learning for them by teachers making this explicit, their teachers having high expectation around what they would achieve based on them as an individual, and developing a relationship with their teachers based on the teacher having a genuine desire for each student to reach their potential. We have since discovered that this is the findings of some research undertaken by Russell Bishop and others as part of the Kotahitanga project which reveals important information regarding factors that improve the achievement of Maori students, in particular, but all students as well. So to the parents who are being told those three words in whatever form, please do not accept that they tell you anything you need or want to know about your child as a learner and let the government know that. Even if you are hearing the words ‘At the standard or above the standard’ what does this tell you about your child as a learner? We think that it tells you nothing as we don’t believe that the standards are an accurate measure of achievement. For example, one of our 11year old daughters who reads at a 12-13 year level with good comprehension skills is reading “at the standard” for her age. We already use a wide range of assessment tools effectively to be able to set goals for individual students and to measure progress. We believe that this is just one of the features that makes our education system recognised worldwide. In our experience no student is ever motivated by the knowledge that they at failing i.e. below the standard. In fact it usually has the opposite effect. We have grave concerns that the stigma attached to being labelled a failure for a large number of learners will not only affect individuals but will have far reaching consequences. We fear that we are teaching a generation of children who will carry the label ‘failure’ into adulthood. In attempting address a perceived ‘tail’ of underachievement this government has created a monster. One school I know of uses “working towards the standard” instead of “below the standard”. I think the former is a much more positive way of putting it (give the teacher has to say it) i.e. the standard is a measure of work that the child can accomplish at some point in the future not something in the child that is “below standard”. My suspicion is that the terminology is illegal. The school is allowed to change the terms, as your schools has, so long as the meaning is still clear. “Working towards” is a much kinder and more positive term, and if NS are to remain them that is preferable. Of course, most preferable of all would be to scrap the flawed and un-needed system altogether. As always thanks for sharing – abuse starting on the school and national standards and this is useful insights. At our school we discussed all this back in 2010 and came up with a way of reporting against the levels-( towards level 3, at level 3 etc.) with a shaded box to show the expected level. We gave the two reports separately.We consulted with parents and they were unequivocal in not wanting us to use the terminology “at, above, below and well below” on reports.This terminology is only required when schools send information to the MOE and is definitely not required on children’s reports. Sadly the MOE sample reports were picked up by many school principals without due consideration. Good ideas – sad that we have to work around official policy in this way in order to protect our students. I am thinking about ways parents can request not to be sent Nat St info. At our school we send Nat St home by post as a completely separate report so that parents can choose if and how to present to their children. We think the cost is worth it. That’s a fabulous idea, Kelvin. As a parent I would truly appreciate that – even being given it on a separate envelope in school would be good, so we can choose whether or not to view it and, even more importantly, to share it with our tamariki. I think that idea has huge merit. Yes Kelvin, I love this idea! I am going to address it with my principal. 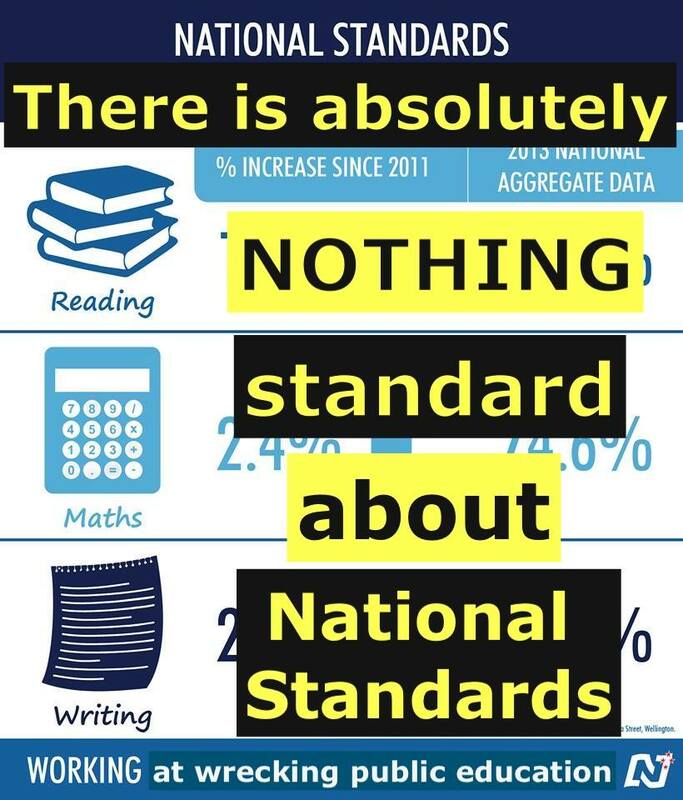 Too many of our children are forming opinions of themselves as learners on national standards. Choice is good! As a retired teacher who specialized in teaching the” late developers,” I look at my old pupils and know how well they have done in their professional careers and am so glad they were never told they had not reached the national standard at the required age or time at school. They all got there in the end with their self esteem intact,working as town planners, architects, chiropractors etc and are now caring parents of school age children concerned about their kids not meeting the standards. How sad this situation is for both parents and kids. As both a parent and a teacher, I am finding it difficult to understand (even though I know the system) how my 5 year old, after 6 months at school, is reading below the national standard. This is a small person who loves to sit at home and pick up books, read and be read to. How can judgements be made of our children who will all learn and develop, and acquire their own strengths at their own rate? National standards is only being applied as lip service for the government. Our children are worth more than a ‘below, at, or above’ grade! My advice, as always, is to opt out. My school uses the words prescribed by the government. It is their policy not ours. If parents hate it it is their problem. Changing it is allowed but why should we protect the government? This is their making. Let them live with it. When parents ask we tell them we do not agree with this rubbish but National/Parata/Key do. This is their doing. Talk to them.